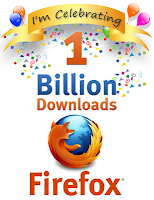 Late last night Mozilla reached a major milestone with the one billionth download of Firefox. "This is a monumental event – Firefox has come a long way since its debut in November 2004, thanks to the amazing Firefox community," Mozilla wrote in a blog post. On Monday, www.onebillionplusyou.com will go live and act as a hub of information concerning the billionth download of Firefox. To help celebrate the milestone Mozilla is asking users to get involved by taking a picture of yourself proudly sporting Firefox apparel (t-shirt, hat, etc) or poster. You can go to a famous landmark, your favorite place nearby, or anywhere you think will make for a great photo. Checkout the Spread Firefox site for more details. And for those of you that want to follow along as Firefox looks to reach the next major milestone you can do so on Twitter @FirefoxCounter.